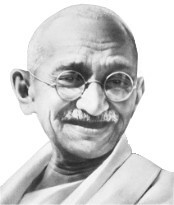 MAHATMA GHANDI was a 20th Century humanitarian and political legend. Once quoted as being multi-religion-al, Gandhi was really a devout Hindu, but he had time for all people from all faiths. He had some insightful suggestions that all Christians could learn from. E. Stanley Jones, a Christian missionary to India, once asked Gandhi the following question: "How can we make Christianity naturalized in India, not a foreign thing, identified with a foreign government and a foreign people, but a part of the national life of India and contributing its power to India's uplift?" Fair question. Jones was genuinely trying to learn something new from the man who became a good friend to him. Gandhi apparently responded to this question without hesitation, offering four pieces of advice; he's quoted as saying, "First, I would suggest all of you Christians, missionaries and all, must begin to live more like Jesus Christ. Second, practice your religion without adulterating it or toning it down. Third, emphasize love and make it your working force, for love is central in Christianity. Fourth, study the non-Christian religions more sympathetically to find the good that is within them, in order to have a more sympathetic approach to the people." This answer is an amazing thing for Christian people to reflect upon. Without being condescending to Hindu's and other faiths, you could almost see Jesus smile with approval as Gandhi spoke these words. It's the raw truth. What do Christians have to offer the world if they can't adhere to this four-pronged piece of advice? If Christians can't live like Christ, and they tone down, dilute or disregard Jesus' teaching, and if they can't simply love, and show great tolerance and humility in learning about others and their philosophies, to please their God, what on earth can they offer? There is little to be said further on this topic. Everything that Gandhi said was Biblical. It simply requires humble reflection.